Pump it up! 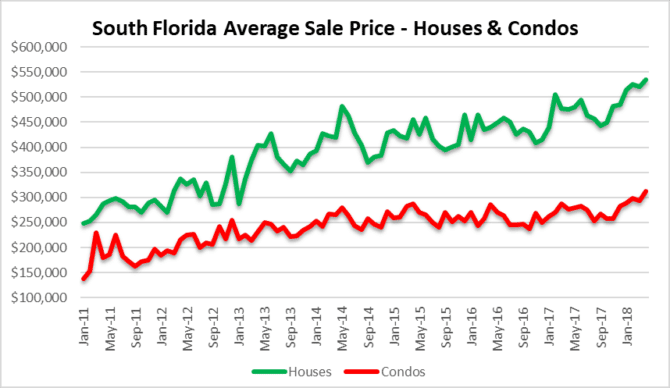 Memorial Day weekend is here and it’s time to kick back, relax and look at a few charts of the South Florida residential real estate market. Today we will look at the average sale prices, transaction volume, mortgage rates and foreclosure filings. The April existing home sales data was released this week and prices continued to climb in the Miami-Dade, Broward and Palm Beach residential markets. Keep in mind that these properties were most likely placed under contract in February or early March before the latest spike in mortgage rates. Single-family homes reached a peak of $535,433 and condos reached $311,381 during the month of April. Is this a blow-off top? Only time will tell. We always say that one month doesn’t make a trend and we will have to sift few a few more months of data to see if this was the peak for the cycle. The monthly average transaction volume has been trending lower after it reached a post-crash high in 2015. Through four months of 2018, the average monthly volume is down 2% from 2017 and 10% from 2015. Mortgage rates made a big move in the last few weeks, but may be settling down again. 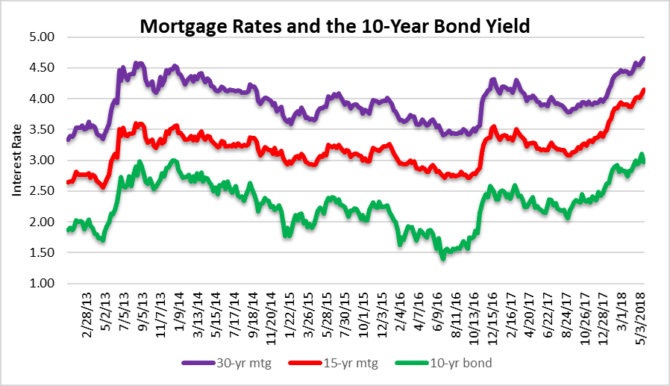 Our next chart shows how the 15-year and 30-year mortgage rates compare to the 10-year treasury yield which has been on the rise. It will take a few months to see the impact of these rates moves, but they will certainly be seen in transaction volume and sale prices as we move into the summer months. This last chart is just bananas. Take a look at this massive move in the monthly mortgage foreclosure filings in South Florida. 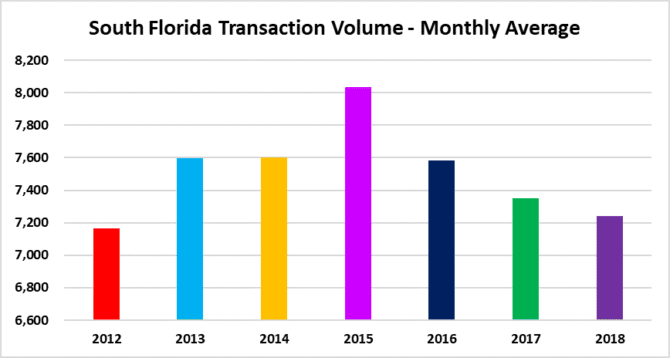 After taking a brief hiatus from the FEMA hold after Hurricane Irma, the pace of new filings has really spiked and we anticipate high volume through the remainder of the year. This should come as no surprise, since many of the lending practices that led to the last crash seem to be back in full force. Don’t forget to have some fun over the holiday weekend & enjoy this classic tune! This entry was posted in Condo market, Market Insight, Single-family homes, South Florida Real Estate and tagged condo prices, foreclosure, home prices, mortgage rates, South Florida real estate. Bookmark the permalink. Both comments and trackbacks are currently closed.